The flight to Surabaya was delayed about one and a half hours and when we arrived we were held on the plane for 20 minutes because of a violent electric storm immediately overhead. Eventually we were allowed off and got drenched in-between the airplane steps and the shuttle bus to the terminal. The ride to the terminal was enlivened by more people taking photos of Mark and coming to shake his hand. Outside the airport we were met by our new guide Faisal and his driver. After our three days in the jungle it was lovely to check into the Majapahit Hotel in Surabaya; another colonial heritage hotel with a very colourful history. The hotel was arranged around a series of immaculate garden courtyards some with ponds, some with lawns and flower beds. Our huge room had beautiful antique Indonesian furniture and a wood panelled bathroom, more importantly it had a hot shower and fluffy towels, bliss. We had read that the Majapahit had one of the best Chinese restaurants in Indonesia so once we had settled in we headed there for dinner. We were a bit bemused when we looked at the menu and discovered pizza, burgers, salads, all the usual ‘international’ favourites. We spoke to the waiter and discovered that there were two restaurants in the hotel and the Chinese one was upstairs. With much apologising we abandoned our table and started again, we were glad we did, the meal was excellent. At 8.30 the next morning Faisal picked us up for a ‘half day tour of Surabaya and the journey to Mount Bromo. Surabaya is Indonesia’s second city, it is huge and bustling but isn’t really set up for tourists, the ‘half day tour’ took two hours, we saw a Chinese temple; a spice market which had dozens of stalls selling garlic, shallots, chilli and ginger, the basis of any good curry! There were a few stalls selling fresh meat which didn’t look very appetising, and at one end a fish market which didn’t open until the afternoon so we were spared lots of raw fish in a small, enclosed, hot environment. After that we walked to the Arab Quarter and walked through the completely authentic Arab bazaar, it was very strange, we felt like we had switched continents for half an hour. The Arab market was the only place in Indonesia where we saw beggars. Finally, we got back in the car and drove to visit the cigarette museum, this was more interesting than it sounded. It traces the story of one family from China who arrived in Surabaya in the 20’s and opened a market stall, from that beginning they built Indonesia’s biggest cigarette company, the museum is based next to the original factory which still makes cigarettes by hand (each operator rolls 400 cigarettes an hour, the other, mechanised factories are out of town). One of the companies most popular products is the clove cigarettes which are widely smoked in Java, they are called Kratak after the sound of the clove oil crackling as it burns. Next to the factory is the family compound where they still live. Apparently that was it, we had seen what Surabaya had to offer! Back in the car we set of for the four hour drive to Mount Bromo further east. The drive was interesting but not scenic, it’s fascinating to drive through towns and villages seeing local people going about their everyday business. Eventually, after about three hours we turned off the main road and started to head into the mountains, very quickly we climbed into thick cloud and the driver carried on picking his way along the narrow road negotiating other cars, potholes, dogs, and the ever-present scooters in virtually zero visibility. The climb was steep and we were very pleased to arrive at our hotel the Jiwa Jawa, allegedly the best hotel in the Mount Bromo area. It was a nice hotel, our room was simple but comfortable; there is a gallery on site which was exhibiting fabulous photos of the local volcanoes and sculptures by local artists. The restaurant had a limited menu but the food was good and we got the feeling that beyond the cloud that surrounded us there was probably a beautiful view! The purpose of our visit to Mount Bromo was to view the sunrise over the range of volcanoes, to do that we had to leave the hotel at 03.45 the next morning. Bleary eyed we met Faisal and a local driver in a 4-wheel drive Jeep and set off up the mountain. It was pitch dark so we couldn’t see where we were going but we were conscious of driving up a very steep mountain road, then down steeply for a few minutes and then we seemed to cross a plain, finally we climbed up again and arrived in a village thick with other jeeps carrying visitors arriving for sunrise. It took about 45 minutes to complete the trip. We followed Faisal to a viewing platform and watched as the sun rose. We didn’t see the bright colours at sunrise that Mount Bromo is famous for because of the cloud but it was great to see the volcanoes piercing the cloud and gradually being thrown into relief as the day dawned. We spent an hour on the platform and then found our jeep and started our journey back to the hotel. After about ten minutes we pulled over to a view point and suddenly the trip gained a whole new dimension as we saw laid out below us the road we had travelled in the dark. We realised that the downhill section had been the descent into the vast crater of an extinct volcano, the crater is known as the sea of sand, there are no roads across it just tracks created by the local drivers who are licenced to drive across it. 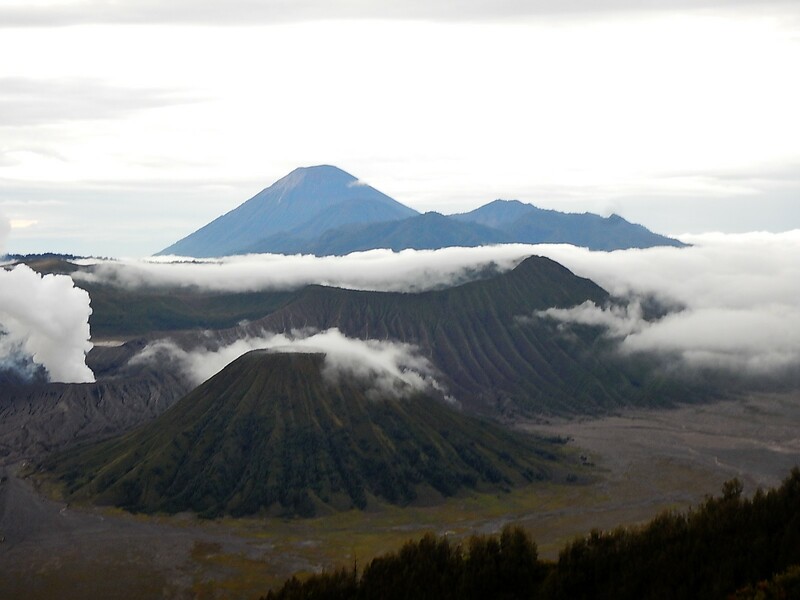 Strangely Mount Bromo itself and its dormant neighbour mount Bartok formed inside the ancient crater, they rise from the middle of the Sea of Sands. As we drove back across the crater we stopped half way, some people were setting off to walk up Mount Bromo to look into its crater which was belching smoke and steam but at 06.00 in the morning, with no breakfast inside us and being aware of the altitude (over 2500m) we decided against that. We did walk across the sea of sand to a Hindu temple at the foot of Mount Bromo, it wasn’t very interesting and when I asked Faisal when it was built he told us 1997, so not very historic either. We headed back down to our hotel and arrived back just half an hour before they started to serve breakfast! We spent the rest of the day at the hotel and were pleased to see the cloud clear from the valley to reveal a beautiful view of lots of perfectly maintained market gardening plots perched on the steep valley walls. After our early start, we had an early night and were up in good time to start the four-hour journey back to Surabaya airport and our flight to Singapore.